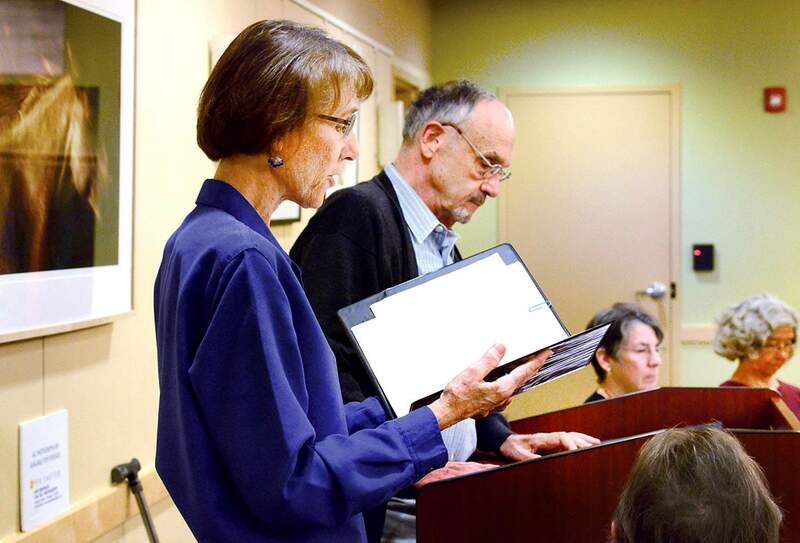 Judy Hook and Dwight Burgess read from the works of Studs Terkel during a tribute to him during the Spoken Word Series at the Durango Public Library. Terkel made an art form of gathering oral histories by interviewing Americans from every walk of life. Its easy as adults to do the same old, same old. But its way more fun to always be learning and trying new things. So when I heard Judy Hook was organizing a program of readings by the journalist Studs Terkel as part of the Spoken Word Series, I said count me in. The occasion was the 100th anniversary of his birth. Im going to admit to almost complete ignorance when it comes to Terkel. I know the bare minimum  he won the Pulitzer Prize for general nonfiction in 1985 for his magnum opus, The Good War: An Oral History of World War II. Ive read about his skill in conveying the stories of the American everyman, and that his long-running radio program  45 years  in Chicago was quite popular. But I dont recall ever actually reading any of his work. And where did the name Studs come from anyway? The New York Times answered that question for me in Terkels obituary in 2008, when the Listener to Americans died at the august age of 96. In the late 1930s, he dropped his given name, Louis, and adopted Studs from another colorful character from the Windy City, James T. Farrells fictional Studs Lonigan, a scrappy Irish kid who learns he cant out-tough the Depression. Did I mention Terkel was pursuing an acting career at the time after earning degrees in philosophy and law from the University of Chicago. Hook pulled six readings, three from The Great Divide: Second Thoughts on the American Dream from 1988 and three from Hope Dies Last: Keeping the Faith in Difficult Times from 2003. She created a wonderful arc of storytelling and beautifully cast the roles in a presentation that did Terkel proud. Dennis Aronson read the interview with Robert Frank, who taught a class called Science and Society at the University of Arkansas. Frank talked about the challenges of teaching the concept of a science as a journey of discovery and process to students who come from a Christian fundamentalist background and have done much of their learning at church and at home. Dr. Quentin Young, the chairman of medicine of Cook County Hospital in Chicago from 1972 to 1981, (where the TV show E.R. was set), and the founder of the Health & Medicine Policy Research Group, was also Terkels personal physician, and he had a lot to say about making American medicine a giant for-profit machine. Jeff Deitch was challenged to convey Youngs outrage. If someone comes in who can be moved safely, or perhaps not so safely, to a public hospital from a privately owned one, it can save the hospital from $10,000 to $20,000 if the patient doesnt have resources such as insurance. Anyone who thinks the golden years are, well, golden, should meet Maggie Kuhn. After the Presbyterian Church forced her to retire at 65, she founded the Gray Panthers, a human-rights organization that also mobilized a lot of young people. Judith Reynolds was clearly in sync with Kuhns philosophy that seniors are one of our countrys untapped resources. Dwight Burgess as Adolph Kiefer reminisced about his experience of winning the gold medal in the 100-yard backstroke in the 1936 Olympics and meeting another Adolf, Herr Hitler, that is. Lest you think Terkel only interviewed the notables in our society, Hook also selected an interview with Liliana Lineres, who emigrated from Peru with her husband, a policeman who was given asylum in the U.S. after being threatened by domestic terrorism. Susana Jones did a masterful job of portraying the part time janitor at Harvard University. And Katherine Burgess brought it home with her portrayal of Linda Stout, the executive director of the Peace Development Fund at the time of her interview with Terkel. She went on to found Spirit in Action, which she now leads. But dont let the titles and accomplishments fool you. She grew up poor in North Carolina, and her Quaker roots  shes a 13th generation Quaker  taught her to speak up for her beliefs that being poor doesnt mean people are ignorant or deserve to live in squalor. I constantly hear from young people that its so expensive to live here, theres nothing to do, yada yada ... So where were yall Monday night, when you could have enjoyed an engrossing hour from an author Im sure you know nothing about, then left for an equally engaging discussion with your friends over coffee? Hook hasnt scheduled the next Spoken Word event yet, so keep your eyes peeled for announcements at the library, online or in The Durango Herald. There were a lot of great lines I could have ended this item with, but I chose one of Terkels quotes from a time when he was the interviewee. Happy Sagittarius birthday wishes go to Gary Penington, Shiann Homer, Darryl Hunt, Karen Siegrist, Allison Epstein, Nancy Loftis, Kathie Hudson, Cindy Atchison, Brandon Engle, Shane Minerich, Ray Schamel, Tyler Wood, Mary Downey, Kristen Dugan, Diane Higgins, Amanda Preston-Araujo, Ernie Shock, Tierney Skahill, Tyler Wood, Isabel Gray, Caroline Tidwell, Elise Tidwell, Len Hahl, Nancy Shipps, Ian Junkermann, Barbara Elliott, Tabitha Heckman, David Kolb, Amy McClellan and Izzi Lockhart (101!). The weather is going to be so nice this weekend, I hope theres a good turnout for A Brotherhood Active Towards Education of Colorado District 8s 20th annual Toy Run on Sunday. It will take off from the Fun Center, 29603 U.S. Highway 160 in Grandview. The center opens at 9 a.m., and at 10 a.m. coffee and doughnuts will be served. At 11 a.m., the motorcycles will take off, arriving at the Veterans of Foreign Wars Post 4031, 1550 Main Ave., for chili, giveaways and a small silent auction at noon. Windwolf Productions will add to the festivities with some live music. All it takes to join the fun is a toy worth $10 or more or a $10 cash donation. Lou Cundiff from ABATE tells me that last year, the event made a donation to Project Merry Christmas of $2,000 as well as delivering a whole bunch of toys. It seems like the 20th outing should be an occasion to beat all previous records and make Christmas a lot happier for many La Plata County kids. Gearing up for the holidays for their anniversaries are Bill and Susan Hermesman, Scott and CeCe Sallee, Hal and Vivian Emrich, Bob and Linda Gramera, Dan and Mary Howell and Wayne and Vicki Hose.